This basket is filled with more delicious confections and treats! Our Hibiscus Basket includes a loaf each of the Ginger-Pumpkin and Banana-Poi breads, and a half-dozen each of the Liliko`i Lemon Bars, the Kona Coffee Fudge Brownies, the Guava-Raspberry Macadamia Nuts Squares, and the Coconut Shortbread Cookies. 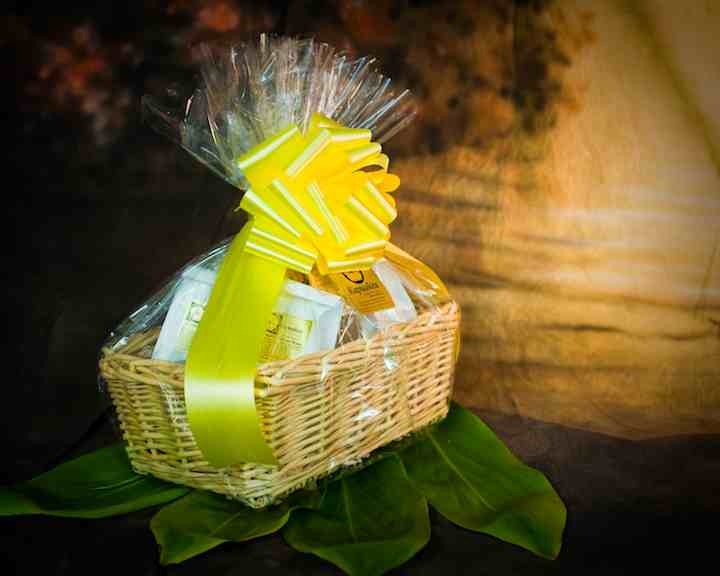 All our beautifully woven baskets come wrapped, ribboned, and tied with a bow. You may also ask for a Kapuakea Products gift card to include a special message to the recipient! This one is amazing! Our largest gift basket, the pikake, is filled with lots of sweet stuff to delight anyone. This basket contains two loaves of the Ginger-Pumpkin Bread, one Banana-Poi Bread, and a full dozen each of the Liliko`i Lemon Bars, the Kona Coffee Fudge Brownies, the Guava-Raspberry Macadamia Nut Squares, and the Coconut Shortbread Cookies. 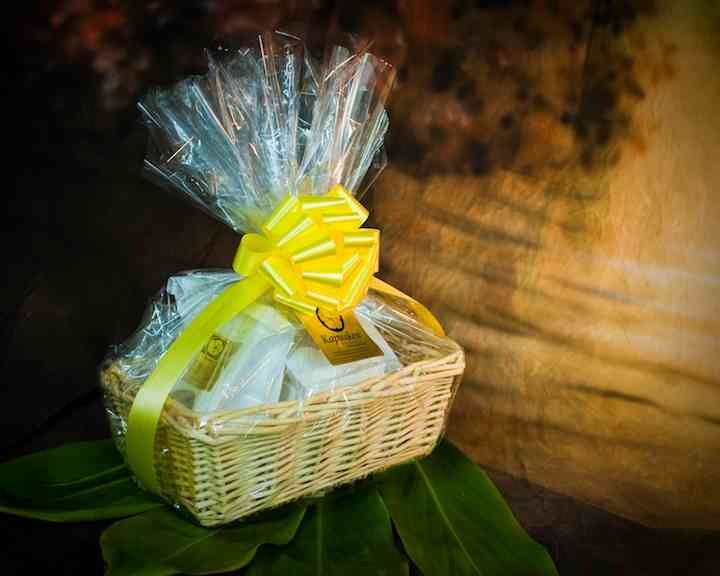 Our plumeria basket gives its recipients a delicious taste of what Kapuakea Products has to offer! This basket contains one Ginger-Pumpkin Loaf and a half-dozen each of the Liliko`i Lemon Bars, the Kona Coffee Fudge Brownies, and the Coconut Shortbread Cookies.